Every evening we tabulate the hottest penny stocks trading on the Toronto Stock Exchange (TSX). See the entire list here. It looks as though you are curious to see some of the content we offer to current AllPennyStocks.com Pro members. Well by all means, enjoy the content below, but before you are able to review this content, we do need to make sure you fully understand and agree to our disclaimer. With that said, if we’re on the same page here and you agree to our disclaimer, click the button below and enjoy our penny stock of the day content. 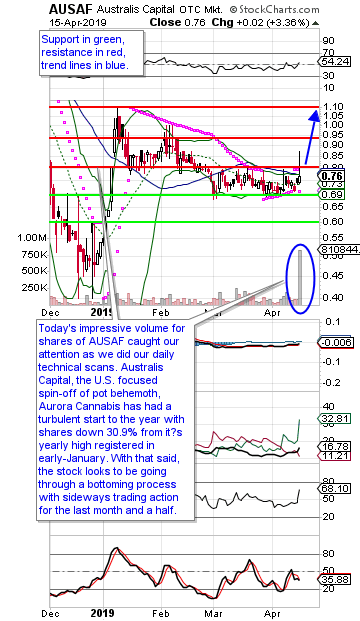 Today's impressive volume for shares of AUSAF caught our attention as we did our daily technical scans. Australis Capital, the U.S. focused spin-off of pot behemoth, Aurora Cannabis has had a turbulent start to the year with shares down 30.9% from it’s yearly high registered in early-January. With that said, the stock looks to be going through a bottoming process with sideways trading action for the last month and a half. It’s this bottoming process, coupled with today’s strong volume which was successful enough to break above a key resistance level ($0.80). Unfortunately, the breakout didn’t hold, with shares closing the day below the important $0.80 level. However, we are optimistic that the bulls are trying to finally shake off this multi-month downtrend and eventually make another run at the early-January highs. If the bulls are to succeed, above the $0.80 resistance lies more at $0.95, $1.10 and $1.35. What we need to see is a bit more sector wide optimism in the coming days and weeks to really build some momentum. If the pot sector gets hot again, we think a run back to those early-January highs would not be out of the question. As such, we would place a price target at $1.09 to capture the majority of those gains. As for support, we would watch the $0.70 support to act as a key buffer on the down side. Below that, further support would likely enter the picture at $0.60. For this trade, we would not want to see the $0.70 support breached in a meaningful way, so would place a stop loss at $0.685 to ensure that we limit downside risk. As mentioned of the top, the key for a successful trade here is a clear breakout of the $0.80 resistance level. With that said, we would only enter the stock upon a close above $0.80, specifically on continued strong volume. If the stock doesn’t break and close above $0.80, we would stay away from the trade as a failed breakout might embolden the bears and push shares lower in the short-term. Based on a $0.80 entry level, our upside potential looks to be 36.3% while our downside risk is limited to 14.4%. Adopted in 1999, the Penny Stock of the Day continues to be the feature of choice for thousands of technical traders each day for its uncanny ability to predict trend and momentum changes. 30-day averages range anywhere from 6% in severely declining markets to 25%+ in advancing markets. Criteria evaluated for each trade idea include technical indicators, technical patterns, support and resistance levels, candle stick analysis, trend and moving average analysis and others. Each penny stock trade idea outlines a recommended entry level, price target and stop loss level. This feature is best suited for investors with some technical analysis experience and knowledge. A new trade idea is added every business day (excluding holidays) around 8pm ET. Non-biased Canadian & U.S. penny stock picks with specific entry / exit levels. Daily "Penny Stock of the Day" trade ideas with full access to monthly average totals & historical accuracy averages. Under $0.25 momentum plays, a feature highlighting the hottest moving penny stocks trading under $0.25 per share. Monthly sector watch, always know what sector is all the rage among the investment community, and what companies are set to benefit from this sector momentum. Indices & commodity commentary / analysis to give investors an edge on overall future market direction. Ad-Free viewing of AllPennyStocks.com and AllPennyStocks.com Pro. April 15, 2019 Top penny stock mover during the last 30 days, rose 38.78% from day of alert. Upgrade to AllPennyStocks.com Pro to view entire list. Free 14 Day Trial! April 01, 2019 Top penny stock mover during the last 30 days, rose 46.61% from day of alert. March 28, 2019 Top penny stock mover during the last 30 days, rose 58.84% from day of alert. AllPennyStocks.com / BullishInvestor.com is not liable for any losses or damages, monetary or otherwise that results from buying or selling on the information found in this website or its e-mails. We do not make any recommendations to buy or sell any security. The Buy, Sell and Hold ratings given for each Company are automatically generated via the BullishInvestor.com proprietary technical analysis algorithms and other proprietary systems. BullishInvestor.com does not evaluate the accuracy of the said ratings systems and has no influence on the outcome and particular rating of each stock. Investors are encouraged to do their own due diligence and use the BullishInvestor.com's rating system as educational and NOT as financial advice. The only thing we recommend is consulting a financial consultant before you make any trade. To read the full BullishInvestor.com disclaimer, click here.